Quality time with family and friends, another installment of a lifetime series. 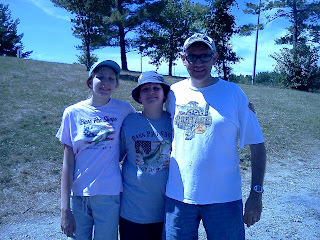 This past Saturday I took Mr. 10 year old and Miss 12 year old fishing for the first time. 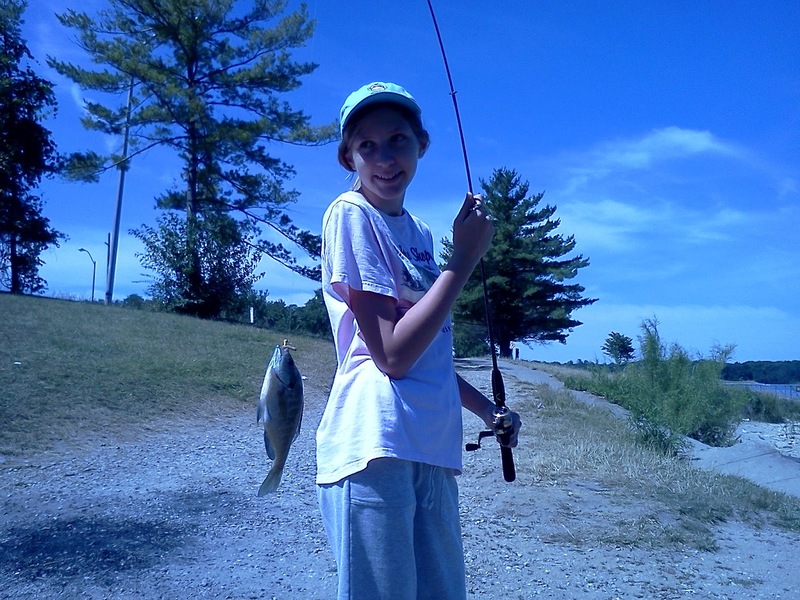 Guess what: fishing trips are not necessarily about the fishing. As many of you probably already know, this is about parents and children and friends and memories and getting out of the house and more. 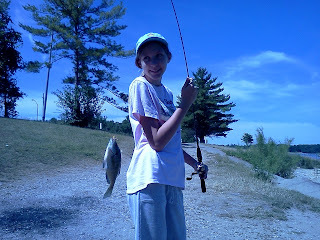 Aside - a few years ago, we went "fishing" at our neighborhood retention pond a few times. That doesn't count, and neither did fishing from the boat in the Florida Keys in 1998. Earlier in the week, a family from our church small group called and invited us fishing. With their extra rods, reels, and tackle, all we had to do was show up. Another small group family came along, so it was three dads and three groups of kids. The kids had a great time catching real fish with real fishing poles, having never done it before. They also had a great time with their friends. I had a great time too, even with the privilege of baiting the hooks, removing the fish, and generally getting my hands dirty. Also for me, I had a good time with the guys too. They all want to do it again, so it looks as if we now have a new hobby in which to invest. Where is a good place to get setup with supplies at a good price, I wonder? The reason it took me until age 46 to figure this out is because fishing didn't go well for me back in the 1970s. This is when fishing meant going to some unknown river somewhere, either late at night or early in the morning. When we got there, we could be joined by bugs, bad weather, and boredom. That did it for fishing and me. With few exceptions, that was the end of that, and good riddance. The sunfish is at the bottom center. One day during this time I heard my dad ask me if I wanted to go to the bike shop with him and my brother. Yes! I love new bicycles! Banana seats! Chrome handlebars! So I went. Too bad he really said "bait" shop. Jars of worms and bins of crawdads, crickets, and tadpoles aren't very exciting, unless you're a fisherman (or a bird). The moral of the story here is that when you are a parent, sometimes you've got to revisit stuff from the past and revise your conclusions for the sake of good parenting, even if good parenting is as mundane as a fishing trip. 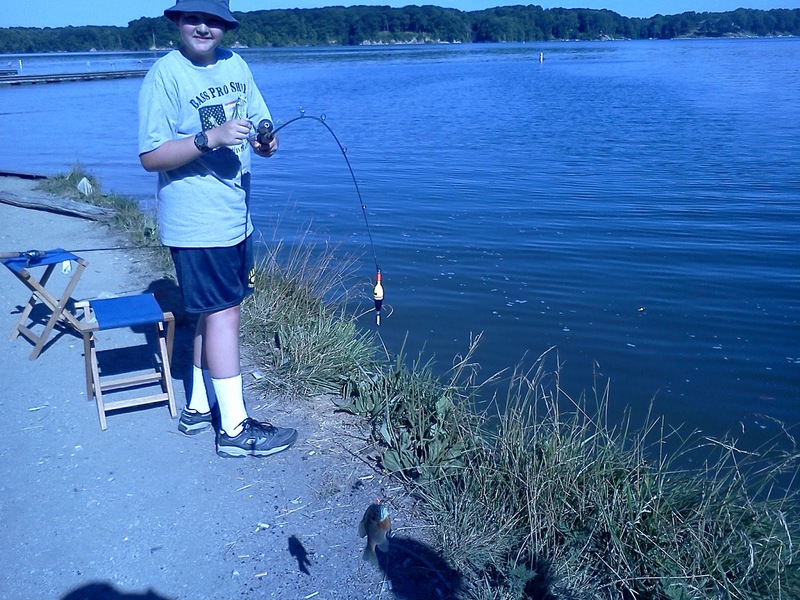 Fishing trips aren't mundane to kids.